transcosmos inc. (Headquarters: Tokyo, Japan; President and COO: Masataka Okuda; TSE First Section: 9715; hereafter, transcosmos) established “Shanghai Center No.3,” a contact center site in Shanghai, China. 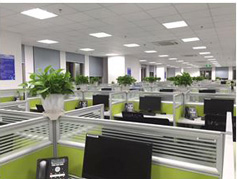 Shanghai Center No.3, transcosmos’ third contact center in Shanghai and seventh in China, started operations in October 2015 and held an opening ceremony on March 29, 2016. It mainly provides technical support by telephone calls and chats to users of cellular, wearable or home devices of Huawei Technologies Co., Ltd. (Headquarters: Shenzhen, China; CEO: Ren Zhengfei; hereafter, Huawei), an industry leader mainly in the area of communications and Smartphone. Shanghai Center No.3 is inside an intelligent office building located in Jin Huan Shang Wu Yuan, Phase 2 in Putuo, Shanghai and is equipped with conference room, training room, lounge, fitness gym, and multi-purpose room. While it is adjacent to large-size commercial facilities and restaurants, it is located in a residential area and also is easily accessible from bus stops and subway stations, making it ideal for the employees’ commuting. 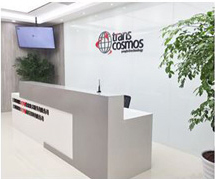 transcosmos, after establishing a contact center in Shanghai in 2006, continued expansion and now holds 3 sites in Shanghai, 2 sites in Beijing, 1 site in Tianjin, and 1 site in Hofei; total of 7 sites in 4 cities. In the China market, it provides a variety of services such as E-Commerce one-stop service including contact centers, digital marketing service, and systems development. transcosmos launched operations in 1966. Since then we have combined superior “human resources” with up-to-date “technological” capabilities to enhance the competitive strength of our clients by providing them with superior and valuable services. transcosmos currently offers Cost Reduction Services (Contact Center, HR/Financial/Sales Back Office, Order Management/SCM, System Development/Management etc.) and Sales Expansion Services (Big Data Analysis, Internet Advertising, Website Construction/Management, Smartphone/SNS Utilization, Telemarketing etc.). transcosmos continues to pursue operational excellence by providing these services through our 159 locations in 28 countries with a focus in Asia. Furthermore, following the expansion of E-Commerce market on the global scale, transcosmos provides a comprehensive, one-stop global E-Commerce service to deliver our clients’ excellent products and services to consumers in 40 countries. transcosmos aims to be the “Global BPO Partner” of our clients to provide them with high quality BPO services on a global scale.